I’ve been wanting to learn more about history for a long time now, and I’ve finally decided to take the plunge and start reading more history books. I started off with a book I’ve owned for about eight years now, but never got around to reading. I think I’ve been avoiding non-fiction because it takes me much longer to read and comprehend it, but I guess I should stop judging my reading by total number of books read. 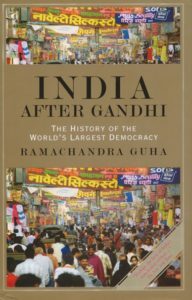 Guha does an admirable job of approaching things from a historian’s point of view, you can see that he has his own opinions as an Indian citizen, but he makes it pretty obvious that they are his own opinions when they crop up. I’m sure there are biases in what he chose to talk about and how he presented it, but those are unavoidable. My only complaint on that front was that Guha chooses to emphasize India’s successes, but doesn’t spend as much time talking about India’s failures. It’s not like he doesn’t acknowledge them, but because he doesn’t give them as much detail, they come across as relatively unimportant. For example, at one point he mentions that an election would be the first “free and fair” election in Kashmir, but all the talk of previous elections in the book so far had been about the heroic efforts of India’s Election Commission to set up elections that actually worked, so how did the Kashmir elections end up unfair? Overall, I thought that this was a great book, and I’d recommend it to anyone looking to learn more about India. It did make me very sad, though – seeing India start out with such well-intentioned and smart leaders and devolve into the mess that it is now. This entry was posted in Books, Reviews and tagged history, non-fiction by Kriti Godey. Bookmark the permalink.